The Amudarya River flows through the territory of Central Asia (Afghanistan, Tajikistan, Turkmenistan, Uzbekistan). The length of the river is more than 1415 kilometers and the area of river basin is 309 thousand sq. km. The river is formed by the confluence of the Vakhsh and Panj rivers. It forms delta, falling into the Aral Sea. Three major right feeders (Kafirnigan, Surhandarya, Sherobod) and left feeder flow into the middle stream of the Amudarya River. The river mostly fed by slush and glacial waters. The water in Amudarya is turbid. 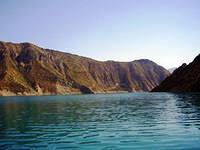 The main flow of the Amudarya River (80%) is on the territory of Tajikistan and partly in Afghanistan. Then the waters of the river flows along the border Afghanistan and Uzbekistan. It falls into the Aral Sea, crossing Turkmenistan. Today, the Amudarya water is used for irrigation. The “Karakum” Canal is the largest channel in the world, feeds mainly by the Amudarya waters, taking almost 45% of its water. The Amudarya waters don’t flow into the Aral Sea because of irrigation, that’s why it dries rapidly. Fishing is developed here. In ancient times, in sacred book Avesta, it is mentioned as "Vakhsh", "Aranha", "Ranha". Khorezm authors called the rever "Okuz". According to this, we can say that the Amudarya River was given the name depending on people living in different parts of the river. The Amudarya River is the only place where freshwater fishes of sturgeon family are inhabited.